I managed to get out of work early so that I could make my way to the London Eye for a short early evening ride that had the simple aim of cycling to a chip shop in East London and cycling back. 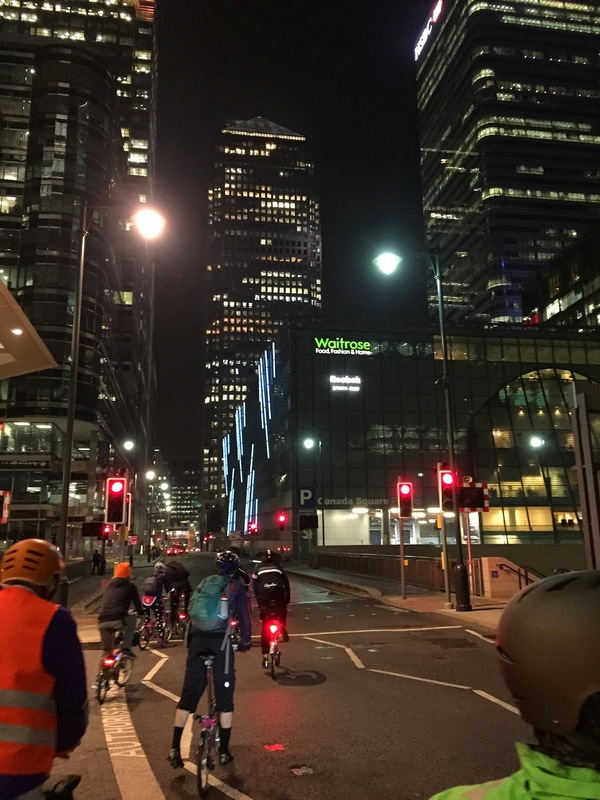 It would involve a 20 mile round trip and and the fact that over 20 people had signed up for this ride was testament to how popular an idea it was. Having had a clear out of various cycling items I no longer had use for I met a few people who had agreed to buy them off me about an hour earlier than the meet time of 18:30. This suited me fine as I could indulge myself in taking photographs of whatever took my fancy on what proved to be a very busy South Bank. Normally I am not a huge fan of street performers as occasionally I am left with the thought that I could do better myself. (One chap murdering a few songs strengthened this view). However, a chap dressed as a metal soldier was quite brilliant and really did move like a machine. As the buyers of my surplus cycling items came and went I took the odd photo. The light was fading and the pictures do not really reflect just how dark it was becoming, such was the low light prowess of my camera. The whole of the South Bank area was teaming with people and there was an expectant buzz in the air. 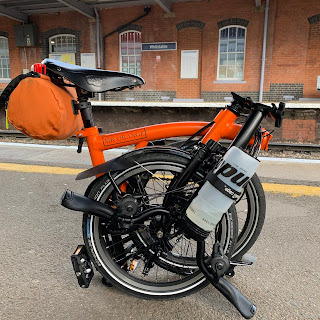 I did wonder how many would be cycling on a 20 mile round trip on Brompton bicycles for fish and chips and took some satisfaction in concluding none would. Looking towards one of the most famous clocks in the world fellow participants started to arrive. By the time I made my way to the start almost all were ready and waiting and the sun had well and truly gone. It was great to see Mark (King of the Hill) again on his S1E X and it seemed like ages since we have ridden together on a ride. Another bonus was seeing Geoff, who like the Brighton overnight ride the previous week was able to make a surprise appearance. Anne was back on the bike again after sustaining a knee injury on a previous ride and it was lovely to see her back too. With a few more familiar faces and some new ones we had a brief run-through of the ride from our ride leader David before setting off into the night. As we set off I could not help but be reminded of the Christmas Lights Ride. I suppose London is pretty well illuminated after dark as there are so many iconic buildings. Our first brief stop was the tried and tested view across the Thames to the Tower of London. Those of you who have read my post on the Christmas ride might understand why I mentioned it when looking at the photograph below. It was a lovely night but I probably needed an extra layer. Colder than I had predicted I felt the chill every time we stopped for too long. The further east we cycled the less traffic we encountered. 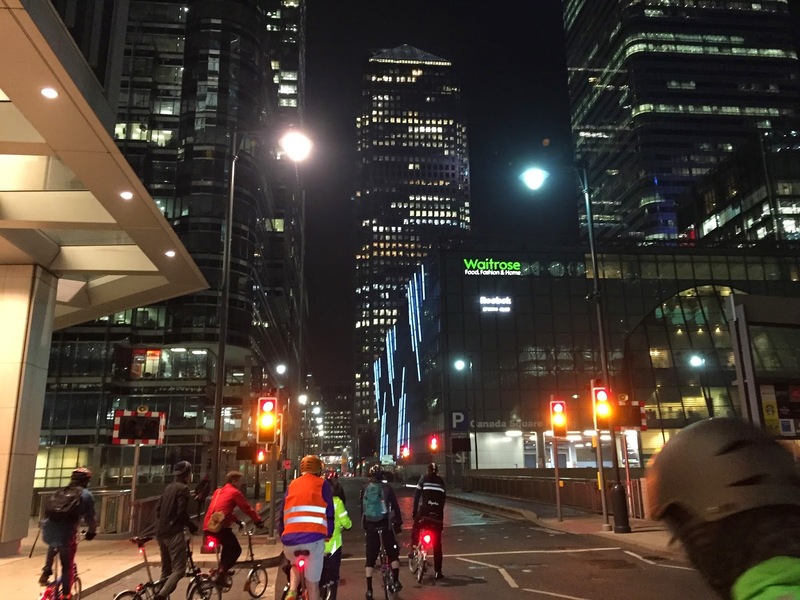 Having the roads almost to ourselves was a bonus and cycling through Canary Wharf was almost rendered a ghost town during our after hours sojourn. 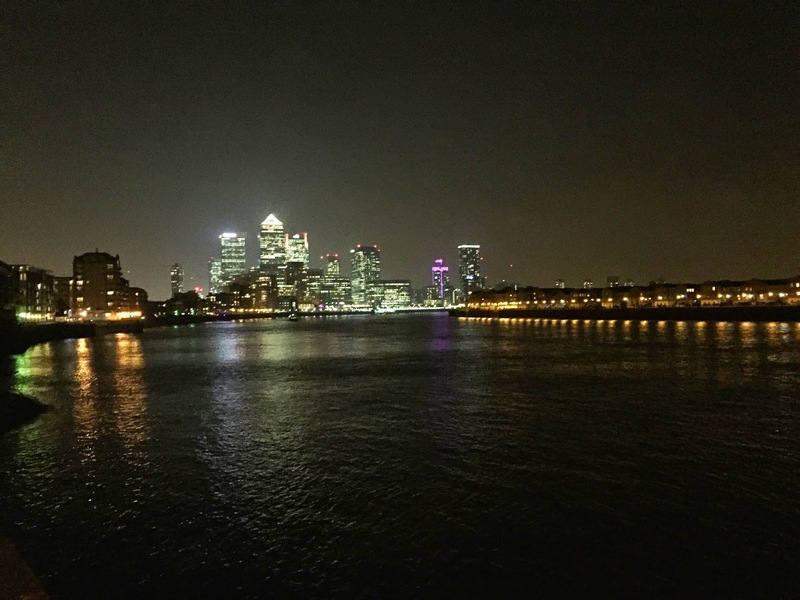 As I cycled through Canary Wharf I again was struck that I must come there again to take more time to take a few photos. Although I keep thinking this, I have yet to actually do it. We reached the Cutty Sark in Greenwich pretty quickly and the temptation of a hill was dangled in front of us. Anne sensibly declined, not wanting to put her recovery in jeopardy and waited for our return with others who didn't fancy a hill at that time of night. During the week I found myself performing standing long jumps. I will not go into the reasons why but I will only say that at the time it was not only a good idea, it was a necessity. The result however was an abdomen that felt as though I had attempted hundreds of sit-ups without warming up. The hill was little trouble for me but I knew the muscles in my stomach would let me know about it the next day - which believe me they did! (No more standing long jumps)! Returning to the Cutty Sark we made our way to the foot tunnel underneath the Thames - some via the lift, others using the stairs. On reaching the bottom the long stretch of tunnel, its acoustics and the general child-like enthusiasm that I feel is in all Bromptonians there was a gleeful tinging of bells, whoops of delight and eager acceleration. By the time we reached the 'Britannia' fish and chips shop in Popular we were ready and a few hundred metres away I am certain I could detect the smell of fish and chips in the air. Making our respective orders the staff coped valiantly in serving us all quickly. The last time I had chips from a chip shop was at this very location, the last time we did this ride. Never has the humble potato tasted so good. Warmed by the hot food we made our return back to the London Eye. Mark, Geoff and I stayed at the back for most of the ride and it was good to catch up with Mark and what he was up to. Stopping at the views towards Canary Wharf to take a photo we knew that we only had a few miles to go before we reached the end of the ride. Foolishly I had not charged my Garmin 810 after last weeks overnight ride to Brighton. This together with a weeks commute resulting in the battery dying during the middle of the ride, so I didn't know how many miles we had left to go. Soon we reached the Tower of London where a few participants made their leave of the group. Not long after we reached the London Eye where we said our goodbyes and headed out separate ways. Another great ride and again thanks to David for leading and all these who participated. I made my way to Hyde Park Corner and then through Hyde Park. Normally the park always has people ambling around either on foot or Boris Bikes. On this night there was not a soul apart from mine. By the time I had reached my car I had clocked up just over 30 miles. Next week I have the hills of North London to look forward to and as regular readers will know I do love the challenge of a good hill.